As of late I've been trying (Yet again for what seems like the millionth time!) to clean out all the nooks and crannies of my CD collection. While shifting through a pile that felt as if it was going to engulf my room (Seriously, where did I get all these CDs come from? Have they developed the ability to breed like rats?) Bone Shaker's "BANG...You're Dead" fell out. Needing a break from the mad disaster that was once my bedroom I decided to slid this disc into my CD player and see what was what with this band. Logically there had to have been some reason that I had the album I figured. But, whether I bought it, traded for it or if it was some random gift I just couldn't recall. Looking over our records here at Heavy Metal Time Machine I do see that Metal Mark actually interviewed this group at one time and may have even reviewed this album! I fully admit though that I was just too lazy to scroll down through all the postings so it may or may not be there*. Not that it matters right? Even if Metal Mark did review this album it's brand spanking new to me so hey, why not do a write-up I figure. What's the real harm? With that said let's see what is what with the guys (and gal!) in Bone Shaker. Formed back in 2006 under their original name Unholy, under which they released the one album "13 Ghosts", the heavy metal band would change their name a year later before releasing this album on Turkey Vulture Records. Opting to take the name Bone Shaker seemed like a wise-call to me as there were/are far too many bands with either the name Unholy or the name Unholy plus something or rather. With the move to Bone Shaker came this album and, seeing as it was the same three members in both bands, the transaction must have gone fairly smoothly. Here the name of the game is heavy metal with chief songwriter David "Gonz" Gonzalez handling both lead vocals and guitars while drum duties are taken care of by Brian DeHarde. On bass/vocals you have Camille Gonzalez. That means you've got a heavy metal combo made up of either a husband-wife or brother-sister. I'm guessing it's the former. As for what kind of heavy metal you're going to get from this Milwaukee trio? Well, here's a clue. This album features three, yes count them, three songs with hell in the title. You've got "Hell and Back", "Raising Hell" and "Hell Razor"! So, with this band, or rather on this album, you're looking at a heavy metal that is somehow old-school, think W.A.S.P. (only with a bite more of a raw vibe) or maybe older Accept (pre-"Balls To The Wall" meaning with less AC/DC going on), without sounding like an 80's metal album. That might not sound like such a hard feat, but when you've got all these metal tracks with hell in the title (as well as a track called "How we Rock"! ), you're just screaming for it to sound like retro "80's metal". If you've confused as to what's the difference between this form of old-fashioned metal and "80's metal" (as a genre) then be sure to click here: http://www.bnrmetal.com/v3/genres/one/8 . If not then just trek on as this 10-track album sounds for all the world as if you've got these three musicians who were big fans of early W.A.S.P. and bands like Judas Priest, Iron Maiden and Accept. No doubt they said "Anything they can do we can do to!" and from there it just steamrolled With quality in mind, as this is quality heavy metal if nothing else, the three set out to record "BANG...You're Dead" and, for the most part, they succeeded in creating one of those albums that will appeal to older heavy metal fans. It's really not all W.A.S.P. worship (even if this does sound to me a lot like early Blackie Lawless and company! )or all Accept or what have you. There is everything from Iron Maiden to Kiss to be found within this release. It's just that W.A.S.P. would be my first reference point with Accept and maybe Judas Priest following closely behind. 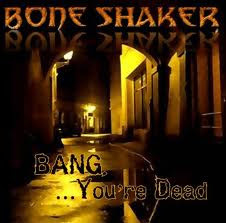 So yeah, it's worth pointing out that while a band like Bone Shaker might be considered to be more of a "new" act then write material that would appeal to fans of "older" metal. If that describes you then Bone Shaker might be worth investigating. Fans of the previously mentioned acts should like this Milwaukee band as well as those folks who enjoy solo Ozzy (more of his earlier material), the heavier side of Twisted Sister (if there really is such a thing!) and maybe even Motörhead! The only drawback to this album is the lead vocals which could be better. Otherwise this album proved to be a pleasant surprise as it reminded me of a time when heavy metal was still exciting. To a point it still is although it's getting harder and harder to find these kinds of bands that want to play no-frills, blue-collar heavy metal without all the flash and splash that comes from having an "image". I close acknowledging the fact that I'm torn between wanting to hear more from this band** (as there is a great deal of potential here ) and the fear that any other material would suffer the same cruel fate as this one (so-so vocals which do little to enhance the cause or advance the band's standing). So this may or may not be my last time hanging out with a "new" Bone Shaker album. Time will tell. *After finishing up this review I took the time to go back and dig around in our previous postings. I discovered that Metal Mark had reviewed this album and, in addition to the W.A.S.P. and Accept reference points, he brought up Grim Reaper. I must admit that I didn't hear that as much my first time through the album so I may just have to go back and give it another spin soon! **The band did release a follow-up album in 2009 called "Union".